Articles for August 2014 Year » SoftLab-Portable.com - Portable Soft! 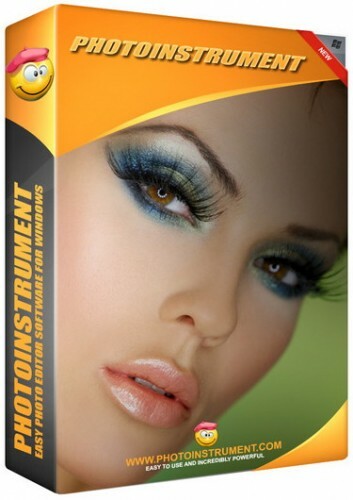 Beauty Guide - allows you to apply makeup and corrects cosmetic defects directly on photos. With Beauty Guide you can make your pictures look even better than the originals! Beauty Guide will help you to apply lipstick, rouge, eye shadow, and powder; line eyelids; change eye color; smooth wrinkles; reduce swelling and eye puffiness; delete birthmarks and blemishes; and bleach teeth. You can do all of this right on the photo! Cosmetic Guide - Virtual cosmetic - corrects cosmetic defects directly on photos. With Cosmetic Guide you'll be able to make your pictures look even better than they do! Cosmetic Guide will help you to smooth wrinkles, reduce swelling and eye puffiness, delete birthmarks and blemishes, and bleach teeth. You can do all of this right on the photo! CUTOUT 4.0 allows you to cut out the finest details and transparent objects at the click of a mouse. Even if the background is complex, CUTOUT 4.0 can remove the objects you need thanks to perfect edge recognition and inside/outside matting – precision cutting out was never easier. Use chroma keying to work on a professional level: choose your background colour and cut out your object onto a monochrome background with one click of the mouse. This filmmaking technique is now in daily use at professional modelling agencies. Recording & mixing: records and plays back a virtually unlimited number of audio and MIDI tracks; DirectX, VST and ReWire effects can be added to each channel/track; Volume, pan, aux sends & returns and effects parameters can be automated: you can "program" fade-in/outs, cross fades, boost the volume of a track when there is a solo etc. 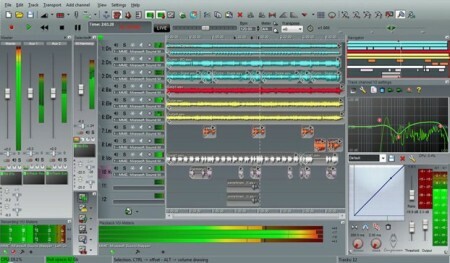 Input processing allows to process with plug-ins live signals. Record the 'dry' (unprocessed) signal while processing and reprocess the recording later - i.e. play a guitar through a distortion plug-in then change the distortion after the recording. ScreenHunter Pro is the most comprehensive and advanced version of ScreenHunter with all the necessary tools included for you to capture, process and edit. It is a total capture solution to save you time and boost productivity. It's compatible with Windows Vista. 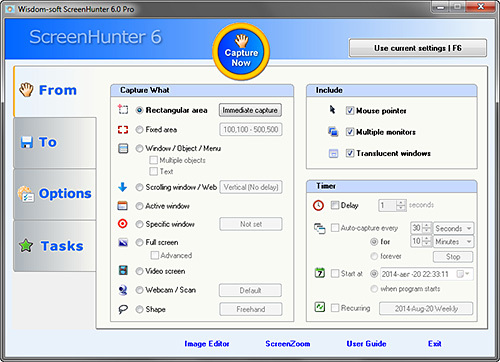 With ScreenHunter 5 Pro, through an easy-to-use and highly flexible user interface, you can immediately see the benefits of these numerous time-saving features and deliver the highest quality screenshots. Powerful and intelligent, ScreenHunter 5 Pro also comes with an Image Editor, Screen Color Picker, Web Capture and Image Scanning feature. ScreenHunter has proven to be an incomparable ally in the area of business. 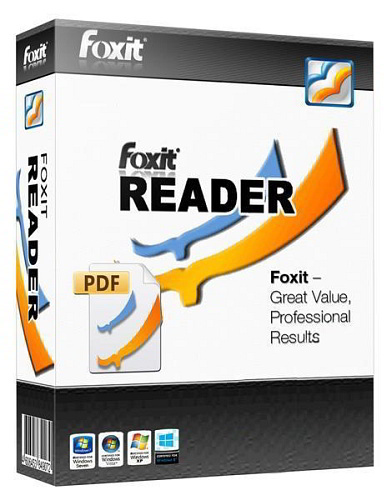 Foxit Reader allows you to create, view and print PDF's. The application is noticeably smaller than Adobe's Acrobat software and therefore makes it ideal for those of you who need a powerful program, which doesn't rely heavily upon system resources. Dia is open-source visual-editing software that can be used to draw many different kinds of diagrams. 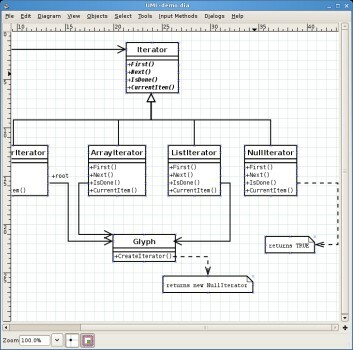 It currently has special objects to help draw entity relationship diagrams, UML diagrams, flowcharts, network diagrams, and many other diagrams. It is also possible to add support for new shapes by writing simple XML files, using a subset of SVG to draw the shape. It can load and save diagrams to a custom XML format (gzipped by default, to save space), can export diagrams to a number of formats, including EPS, SVG, XFIG, WMF and PNG, and can print diagrams (including ones that span multiple pages). PC WIZARD is a powerful utility designed especially for detection of hardware, but also some more analysis. It's able to identify a large scale of system components and supports the latest technologies and standards. This tool is periodically updated (usually once per month) in order to provide most accurate results. PC WIZARD is also an utility designed to analyze and benchmark your computer system. It can analyze and benchmark many kinds of hardware, such as CPU performance, Cache performance, RAM performance, Hard Disk performance, CD/DVD-ROM performance, Removable/FLASH Media performance, Video performance, MP3 compression performance. Create Great Business Cards with Our Quality Business Card Software. Create a Business Card FAST! The Design Wizard creates awesome looking business card from one of hundreds of business card templates in literally seconds. Support for ALL Business Card Stock. Design US size, metric size or a custom business card size. A business card any size between 1 to 4 inches can be created. That makes our business card software perfect for creating a business card for anywhere in the world. Whether you need to track changes in multiple versions of text documents, source code or web pages, conduct code reviews, integrate a visual comparison tool into your version control system, or visually compare two versions of a Windows DLL, ExamDiff Pro is the tool for you. 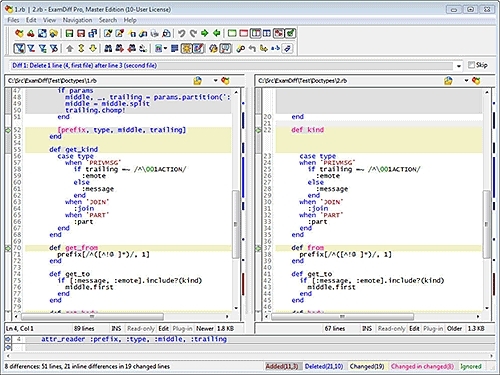 In one program it offers unique and advanced features that are not found in other comparison programs: visual binary file comparison, word wrap, regular expression filters, very fast comparison, named sessions, word and character level diffs, and full-featured file editing. Yet with all its power ExamDiff Pro is very easy to use: its defaults let you see differences in files or directories without ever changing its multiple options.